Fujitsu today announced the Japan launch of "Fujitsu Enterprise Application CHORDSHIP powered by Zinrai." 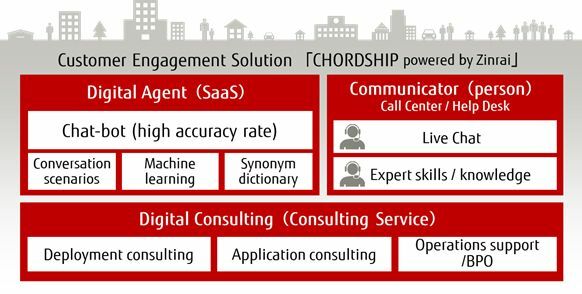 CHORDSHIP takes customer interaction to the next level, particularly in contact centers that are points of interface between companies and customers, and is a solution that represents a first step in Fujitsu's systematic approach to customer engagement. 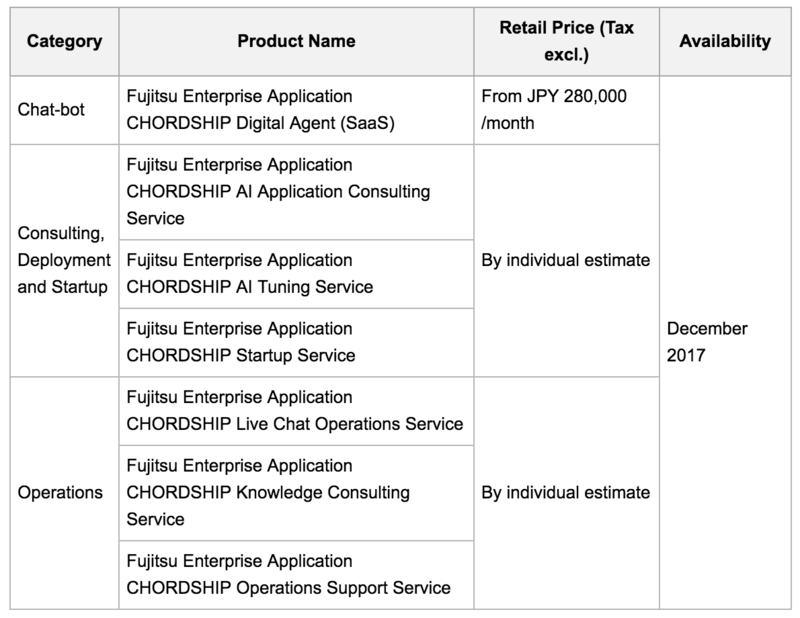 CHORDSHIP contributes to enhanced customer experience and improved productivity in contact centers by utilizing Fujitsu Enterprise Application CHORDSHIP Digital Agent, a chat-bot capable of highly accurate responses gained through Fujitsu’s approach to artificial intelligence, Human Centric AI Zinrai. The chat-bot is offered in combination with a "deploy and build" consulting service, and when up and running, an operations support service. The Digital Agent is offered as a Software-as-a-Service (SaaS), and is able to recognize individual expressions and synonyms in contact center chats, narrowing down the content of the question with high precision while extracting related information from a company's knowledge-bases and FAQs, then generating an appropriate response. Because the Digital Agent can offer a high correct answer rate using only a company's existing data, without being trained on massive amounts of teaching data in advance, customers can smoothly automate operations in their contact centers. Fujitsu plans to rollout operations from early November, initially serving as a new channel of communications for TASKAJI Inc., a company that provides housekeeping matching services and for the Japanese football team, Kawasaki Frontale. In addition, Orient Corporation, one of Japan's largest consumer credit companies, has completed field trials of the application and is now moving forward on studies toward full-scale implementation. Points of contact between companies and customers are changing with the spread of new technologies such as social media, making it even more important to enhance customer experience. Because contact centers have a major impact on customer experience, serving as the frontlines of customer support, they are expected to provide added value leading to customer satisfaction. At the same time, contact centers must not only deal with personnel shortages and the diversification of channels, they also face numerous issues such as facilitating customer engagement. In order to resolve these issues, Fujitsu is offering CHORDSHIP, a solution to raise the quality of customer contact, providing total support for contact center operations using chat-bots, from consulting to deployment, setup and operations, making the customer experience as rich as possible and contributing to improved productivity for contact centers. Fujitsu not only offers consulting on chat-bot deployment, including proposals for AI applications and verification of the effects that can be expected after deployment, based on a customer's existing operational data, it also provides total support for everything from deployment and setup to operations support for contact centers. The Digital Agent, offered as a SaaS, is a chat-bot equipped with an interface that can connect to websites and services such as LINE, Skype, and Facebook. It consists of Zinrai, Fujitsu's approach to AI, which automatically recognizes queries, including an individual's fluctuations in vocabulary and synonyms, and it can generate language as well. It also utilizes a company's accumulated FAQs and other data. The chat-bot, being equipped with Zinrai AI, not only recognizes language features such as individualized expressions and synonyms, it extracts related information from question-and-answer knowledge-bases or FAQs that a company has accumulated, narrowing down the meaning of the question while finding an accurate answer. Because this system does not need to be trained in advance with huge volumes of teaching data, unlike deep learning chat-bots, it can rapidly automate contact center operations. In addition, by applying machine learning to the results of customer interactions, it can improve its own accuracy, enabling it to rank higher those answers that are closest to the correct response. When a Digital Agent is unable to provide the answer a user was looking for, this solution provides a Live Chat Operations Service, which escalates the interaction to live chat with an operator to continue resolving the issue. Not only can operators with specialized skills continue to provide support via chat, they can maintain and improve answer accuracy after the Digital Agent begins operations by sifting through and building up the new knowledge gained from this process. This solution is provided on Fujitsu Digital Business Platform MetaArc, as a service based on Fujitsu's Knowledge Integration(1) concept, which is leading toward the digital business era. 35.0 billion yen in revenue by the end of fiscal 2020 (Fujitsu's fiscal year ends March 31). Comment from Sachiko Wada, Founder, TASKAJI Inc. This application is helping us improve new plans and existing services based on user feedback from this newly created communication channel. We aim to create a service that can respond to user questions and needs at any time through 24/7/365 support with this chat-bot. This application enhances our communication with customers, collecting and analyzing their actual voice data, deepens interaction with the local community, and contributes to the promotion of sports culture. We implemented a trial of this chat-bot in order to validate its usefulness and the impact of deploying it, with the goal of providing complete, real time answers, 24/7/365, to questions customers ask over the web, in order to improve customer support quality and customer satisfaction. Based on the results of this field trial, we are currently discussing a full-scale deployment. A concept in the integration services field that gives form to Fujitsu’s brand promise, "shaping tomorrow with you."